​Brain development occurs quickly in young children, and continues throughout childhood and adolescence. Prenatal alcohol exposure can affect brain structure and cause altered brain development in children. It is important to understand how brain development is altered with prenatal alcohol exposure, in order to develop effective screening tools and treatment options. Magnetic resonance imaging (MRI) can provide valuable information about brain structure and function. The purpose of this study is to examine brain development in children using MRI. 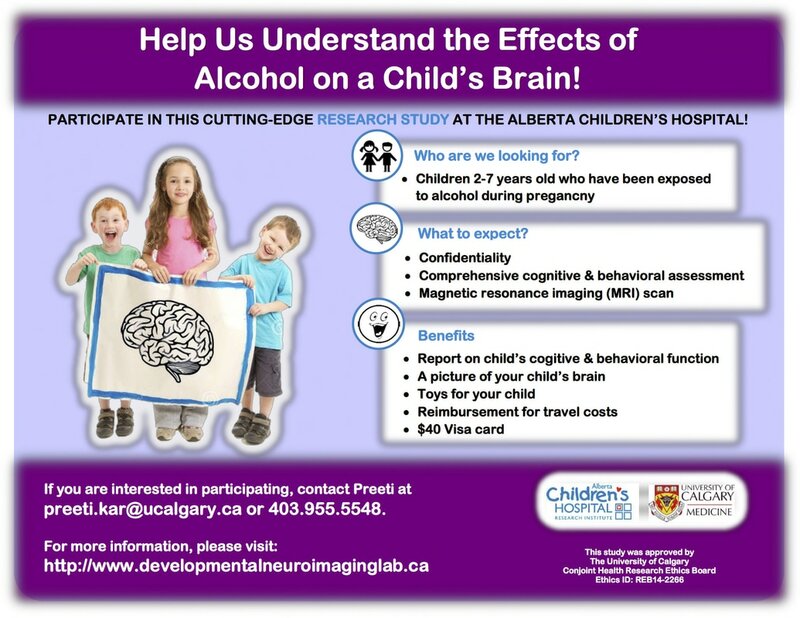 Both children with and without prenatal alcohol exposure are included in this study. Have been diagnosed with a neurological or neurodevelopment disorder including autism, cerebral palsy, major intellectual disability, epilepsy; major medical illnesses, congenital abnormalities; genetic disorders associated with motor or cognitive disabilities. ADHD, learning disabilities and language delay are OK.
Have been born premature (<34 weeks) or experienced fetal distress. Passes for visitor parking will be provided and childcare services may be booked in advance through Emily’s Backyard. By completing a series of brain scans, your child makes it possible for our research to observe changes in brain structure over time. Often, changes over time are better indicators of future success than measures at any one particular time point. We hope to use longitudinal data collected over a series of visits to define a trajectory of structural brain maturation from 2-8 years, and investigate how that is related to changes in learning and behaviour.